I like children better. Offspring sounds like biologically related and Heather isn't. Linda was never a Beatle. She was a Beatle's wife. Doesn't make her a Beatle. Just because "grandchildren" has the word "children" in it does not mean that "child" can also mean "grandchild" or "great-grandchild". They are all separate things, which is why we have different words for them. To coincide with a exhibition called Letters to Andy Warhol, Sean has told the story of how he was a bit freaked out when Andy sent him a taxidermied pet cat for his eighth birthday! Not sure how appropriate a gift, but the present of a dead cat for your birthday is gonna make it memorable. Really. Can you remember what you got for your 8th birthday? How nice of Sean to show up to Stella's show. Do you guys consider Gary Evans, Roag Best, Gregory Martin, Giles Martin, etc. Beatles offspring as well. I know that George Martin, Mal Evans, and Neil Aspinall aren't Beatles, but they were a key part of their life and lived off of them and without these 3 people, The Beatles would be like Flip The Frog or Witchfinder General, obscure and forgotten and I think these people should count as Beatles offspring. HMBeatlesfan, let me answer your question with a question, who sang Roundabout. Great because I drew a picture of Gary Evans licking a lollipop at a Beatles session. Nice picture, got any more. I just saw James on Sunday... OmfLennon he's so sweet. Quiet, but sweet. I went up to him after the concert and said, "I know you've already heard me scream this like 10000 times, but I love you"
he replied, "ah, thanks darling,"
!!!!!!!!!!!!!!?!?!????!!!!!!!!!!! !TFTYFFERGFEUBFKSU FR BHEREJBFBEKSKSUGFKJALKAKBJBHDVJHFVDGHV "HE CALLED ME DARLING!!!!!!!!!!!!!! !1" I whisper-screamed to my mum when I got in line to have my poster and CD signed. After he signed my stuff I asked him for a hug AND HE HUGGED ME. I remember it perfectly, I remember the feeling of his arms around me and the feeling of his slightly sweaty t-shirt under my hand. It was the one time I've felt the most appreciated in my life. I felt blessed by his choice of words while meeting him, I felt blessed by his sweat particles on my hand, I felt blessed by his presence. He didn't have to hug me, he didn't have to sign people's posters and CD's, he didn't even have to go on tour. Needless to say, hugging him was the best few seconds of my life, and I feel eternally grateful that he made me the happiest I've ever been, only for a few seconds. 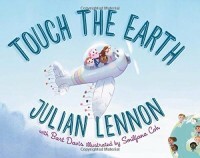 Julian Lennon has a new chidrens book out about the environment. The title is Touch the Earth. Sean Lennon has done a song with Lana Del Rey. The album wiil be out this spring. During her talk, the singer revealed she collaborated with Sean Lennon for one song,”Tomorrow Never Came,” on her upcoming album. When she was writing the song, she explained she thought he would be a good fit for him, but didn’t want him to think she chose him because the single has a line about his parents, John Lennon and Yoko Ono (and of the course the title resembles that of the Beatles classic, “Tomorrow Never Knows ”). That looks quite interesting. Funny also that she named the album 'Lust For Life'; I wonder whether this is a coincidence or a reference.